For some reason, a lot of preemie moms are blogging this week about a transformation, of themselves and of their children, throughout their journeys. Maybe it’s the change of seasons, or that spring is a time for growth and regrowth. Maybe it’s because Parents of Preemies Day is coming up on Sunday. Maybe people are just feeling like they need a boost – some proof that they’ve come very far, an indication that their children are progressing, that they are growing and learning, and that there is hope. I know we’ve been feeling that way lately. 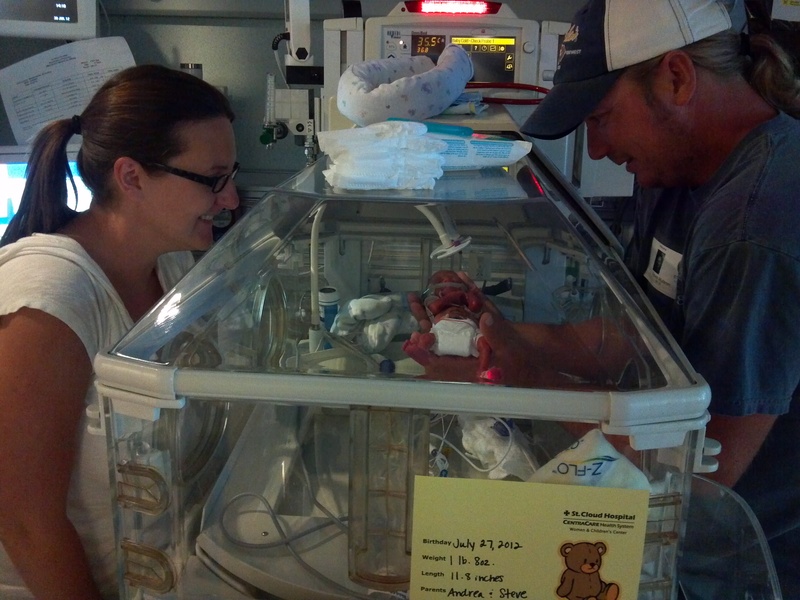 This week, Steve and I found a CD of pictures from the NICU in St. Cloud. The March of Dimes parent liaison, Jen, organized a professional photo shoot for us. But we were transferred so quickly, we never had a chance to see the pictures. Jen mailed us a CD of the photos a couple of months ago, but we forgot we had it. When we looked, we cried. Here is a transformation. Here is proof of strength. Here is hope. Tiny boy. Look at the blue lamb. Little blue lamb looking over tiny Jaxson when he was about 2 weeks old. Oh, I love these! We did the same thing with a stuffed animal and they are still some of my favorite pictures! Thank you for sharing! I know the feeling of yelling “NO – it’s NOT time!” It’s still pretty raw for me. Your JP is adorable! I love reading your blog! Awe, thank you so much, that means th world to me.